Acid reflux is simply defined as the backward flow of stomach contents into the esophagus. It usually involves regurgitation. Almost all infants will "spit up" after some feedings, whether they are breast or bottle-fed. The prevalence of acid reflux in infants peaks between 1 to 4 months of age, and usually resolves by 6 to 12 months. Many of the problems below can also be symptoms or indications that an infant has acid reflux. Not all the problems are common in all infants but are all possible if GERD is left untreated for a long time. 1) Failure to thrive. Infants grow at a steady and predictable rate. The frequent vomiting of feeds will eventually cause weight loss or difficulty in maintaining weight. 2) Food and oral aversions. The infant comes to associate food with pain and this can cause the infant to develop aversion or even stop feeding altogether. 3) Gagging and choking. Infants with GERD seem to have a stronger gag reflex and may gag and choke on their food often. They may also appear to gag and choke for no apparent reason - likely from the refluxed material coming up the throat. 4) Apnea. Infants with GERD are susceptible to apnea because the refluxed material can block the airways. 5) Aspiration and aspiration pneumonia. When refluxed material is allowed to enter the lungs it is called aspiration. The pneumonia may be caused by infection from the aspirated material. 6) Asthma. The acidic reflux material can cause the airways to narrow and create wheezing and shortness of breath which is similar to asthma. Another possibility is that the refluxed acid can stimulate nerve endings causing muscles in the airway to contract. 7) Chronic cough, hoarseness, or laryngitis. This may be caused by the acid damaging the throat and vocal cords. 8) Dysphagia and strictures. Stricture may be caused by scarring due to constant acid exposure. This may cause difficulty in swallowing or dysphagia. 9) Esophagitis. The constant presence of corrosive stomach acid leads to inflammation of the esophagus. 10) Anemia. May be caused when there is bleeding of the esophageal ulcers. 11) Erosion of dental enamel. When the stomach acid reaches the mouth it can erode the dental enamel. 12) Barrett's esophagus. Precancerous changes in the cells of the esophagus. 13) Cancer. If acid reflux is left untreated for a long time it is likely to develop into cancer of the esophagus. Medications like antacids, H2 receptor antagonists, proton-pump inhibitors, and motility agents may be prescribed by the doctor. But all these drugs provide only relief from symptoms and have serious side effects and are harmful in the long run. To avoid the condition from becoming chronic it is best to take the holistic approach which is safer, cost effective and can be incorporated easily in daily life. 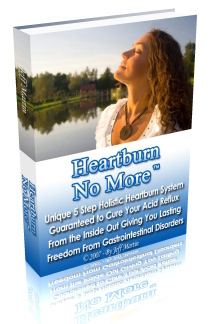 This leads to a healthy life free of not only acid reflux but other diseases as well.